Bonus distribution in enterprises or course allocation at universities are examples of sensitive multi-unit assignment problems, where a set of resources is to be allocated among a set of agents having multi-unit demands. Automatic processes exist, based on quantitative information, for example bids or preference ranking, or even on lotteries. In sensitive cases, however, decisions are taken by persons also using qualitative information. At present, no multi-unit assignment system supports both quantitative and qualitative information. In this paper, we propose MUAP-LIS, an interactive process for multi-assignment problems where, in addition to bids and preferences, agents can give arguments to motivate their choices. Bids are used to automatically make pre-assignments, qualitative arguments and preferences help decision makers break ties in a founded way. 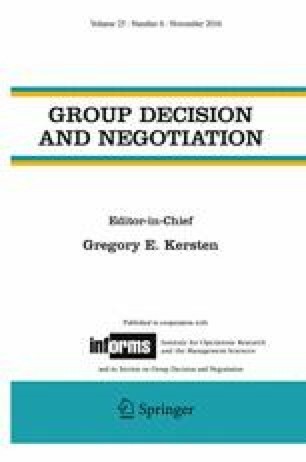 A group decision support system, based on Logical Information Systems, allows decision makers to handle bids, arguments and preferences in a unified interface. We say that a process is p-equitable for a property p if all agents satisfying p are treated equally. We formally demonstrate that MUAP-LIS is p-equitable for a number of properties on bids, arguments and preferences. It is also Pareto-efficient and Gale–Shapley-stable with respect to bids. A successful course allocation case study is reported. It spans over two university years. The decision makers were confident about the process and the resulting assignment. Furthermore, the students, even the ones who did not get all their wishes, found the process to be equitable. The authors are grateful to Yann Ricquebourg for his enthusiastic and fruitful collaboration, as well as to the students of INSA who willingly contributed to the questionnaires. The authors thank the anonymous reviewers for their valuable comments and questions.